Besides the required air flow, noise emission and energy efficiency are key characteristics for axial fans used in the evaporators, condensers and heat exchangers in ventilation, refrigeration and air conditioning systems. These two characteristics are becoming increasingly important for users, due to both legal regulations such as the ErP (Energy-related Products) Directive and higher energy prices and increasing environmental awareness. This trend will gain in importance in the future. For example, further restrictions in the ErP Directive are already looming; the next steps are planned for 2020. Modern axial fans showed impressive gains in efficiency and quietness in the last few years. Their development has been characterized by continuous improvement. For example, while overall static efficiency was around 35% in 2004, it increased over the following eight years to approximately 45% even as noise levels decreased by as much as 7.2 dB(A) compared to previous models. For the motors, there is currently little room left for improvement; for example, GreenTech EC motors with efficiencies well over 90% already considerably exceed the values known from the IE4 efficiency class. 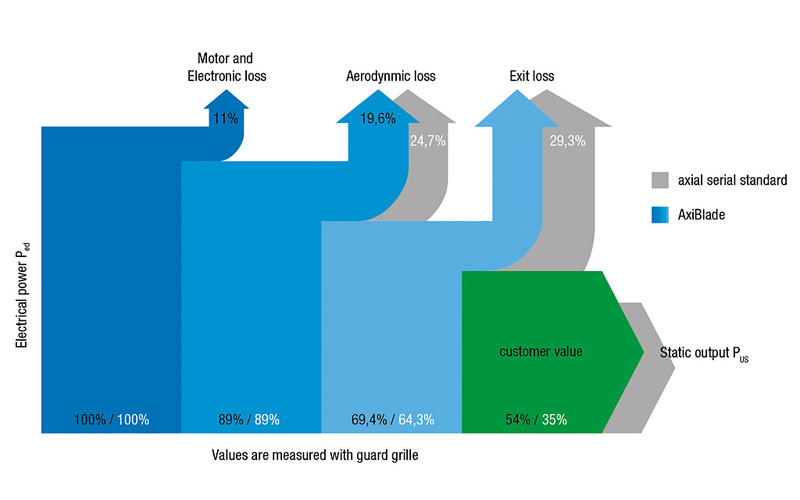 Figure 1: Losses in a free-blowing axial fan, measured with guard grille. For further improvements, fan manufacturers have to do a lot of “tweaking.” While doing so, they need to consider the fan as a complete system consisting of impeller, motor, housing and control electronics in order to maximize the potential for improvement. All components, and even the circumstances of installation in the user device, have to be considered in the improvement process (Fig. 1). Today, efficiency increases can only be achieved with improvements in aerodynamics. Application-specific operating points have to be taken into account during aerodynamic optimization to ensure that the fans really do operate at the best possible level of efficiency when actually installed. Now the motor and fan specialist ebm-papst has put this approach to work in developing the new AxiBlade axial fans (Fig. 2). They can work in a wide range of applications with an efficiency optimum of up to 54% while reaching a noise reduction of up to 8 dB(A) when compared with the standard program. Besides the especially energy-efficient GreenTech EC motors, the new models are also available with the AC motors that are still widely used. Sizes 800 and 910 are currently available. Figure 2: The AxiBlade system with guide vanes. With fans, different back pressures have to be taken into consideration depending on the application and conditions of installation. There is no fan that will work with the same efficiency or noise level under all conditions; any search for an all-purpose unit will be futile. In view of the expected application conditions, optimized Plug & Play system solutions of the AxiBlade range are available. Depending on the pressure ranges required, the use of guide vanes is recommended. The pressure-raising effect minimizes exhaust turbulences, thus the dynamic losses – thus, they contribute to the high energy balance. In addition, there are impellers with special blade geometry and winglets for maximum efficiency; they are designed for the different motors they can be combined with. This, too, increases efficiency and reduces noise. The user can have GreenTech EC motors with integrated control electronics or conventional AC motors installed as drives. And the guard grilles, which are matched to the various combinations, are also aerodynamically optimized. Not only do they protect against accidental contact, they also contribute to the high overall efficiency of the axial fans. Figure 3: AxiBlade operating points for typical applications. The dark areas represent high back pressures up to 290 Pa, where the system with guide vanes can make the most of its strengths. The light areas represent low to medium back pressures (up to approx. 200 Pa) – the range for the version without guide vanes. 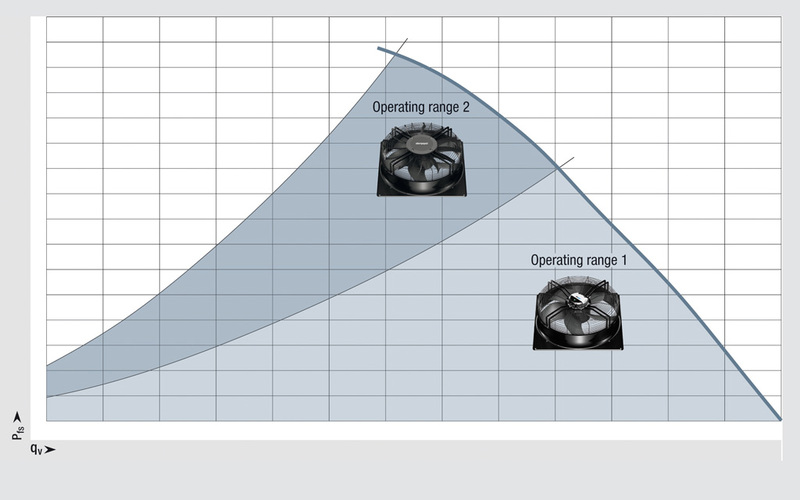 In this fashion, the new axial fans can be optimally configured for a given application. For example, the version without guide vanes is suited to low to medium pressures up to 200 Pa. In this case, the benefits of the guide vanes do not come into play. Even without them, the efficiency and operating noise are much better than the current industry standard. The guide vanes become interesting for high back pressures up to 290 Pa, here the guide vanes are essential to reaching high efficiency (Fig. 3). 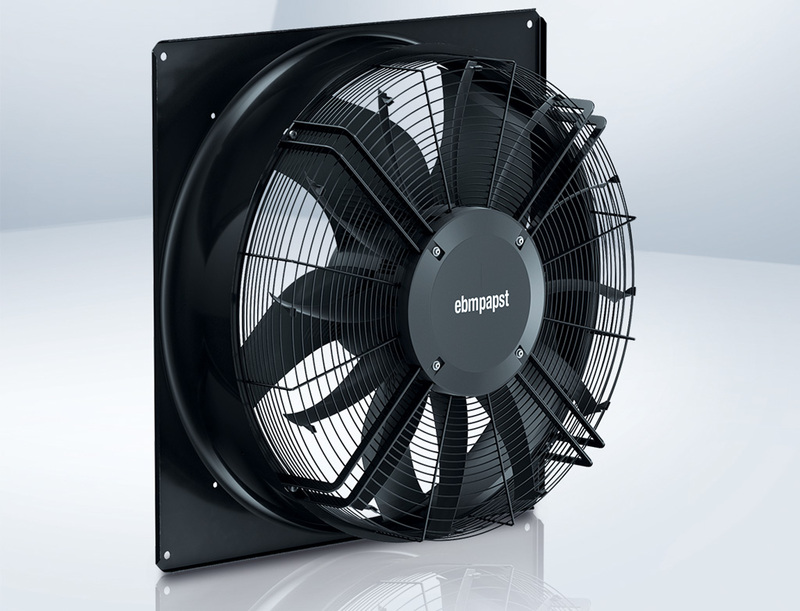 Since the new axial fan’s footprint corresponds to the current industry standard, virtually no design changes in the end unit are necessary (Fig. 4). And the fans are lower than the usual models. The height is likely to play a minor role for most applications, but not for transport. Every centimeter counts when the fans have to be loaded onto pallets or into containers. 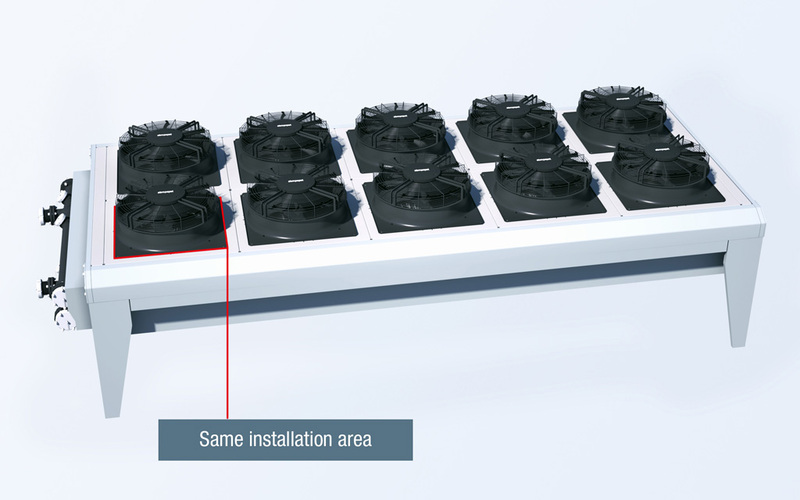 Figure 4: Same installation area: More cooling performance with the same footprint as previous fans. Pictured here is a condenser for refrigeration with ten axial fans. The benefits of the EC versions of the fans are obvious. They include speed control via the integrated electronics, enabling the speed to always be adjusted to match the current requirements. This pays off quickly for the user since EC motors also excel with their high efficiency in partial-load operation and are extremely quiet compared to speed-controlled asynchronous motors, whose triac or variable frequency drive control systems inevitably generate noise. Further benefits include high power density, compact size and constant monitoring of operational data and status information. The latest EC motor, which is also used in the new modular system, also features programmable interfaces and can be used around the world since it works with all voltage variants and power systems. Wireless configuration is possible using RFID (radio frequency identification) and a status LED shows the operating modes. All in all, AxiBlade fans for evaporators, condensers and heat exchangers and preconfigured to user requirements in the factory, are ideal for satisfying the increasingly exacting requirements for energy efficiency, quietness, low operating costs and convenience, today and in the future.